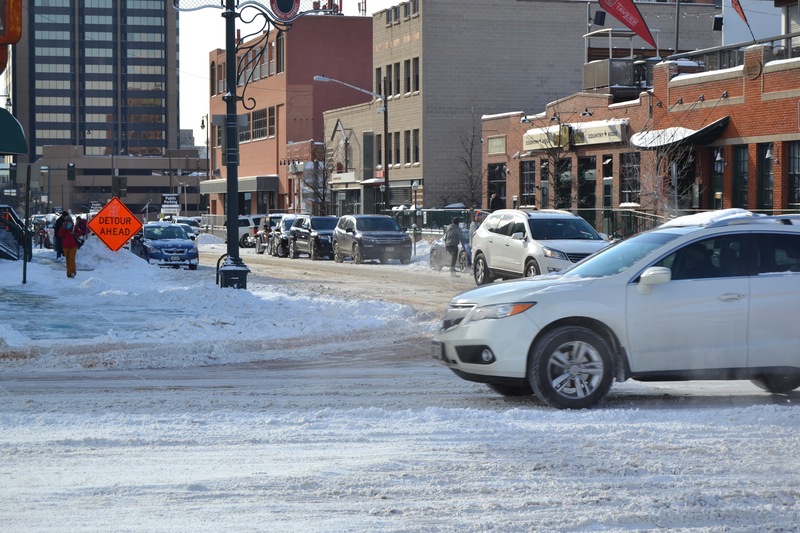 It’s that time of year when Mother Nature shows Denver how much street space is wasted on moving motorists quickly, at the expense of keeping pedestrians safe. That’s “snowy” plus “neckdown.” If you’ve never heard of a neckdown, it’s a traffic-calming technique that extends sidewalks at street corners, making drivers take turns more carefully and shortening the crossing distance for pedestrians. 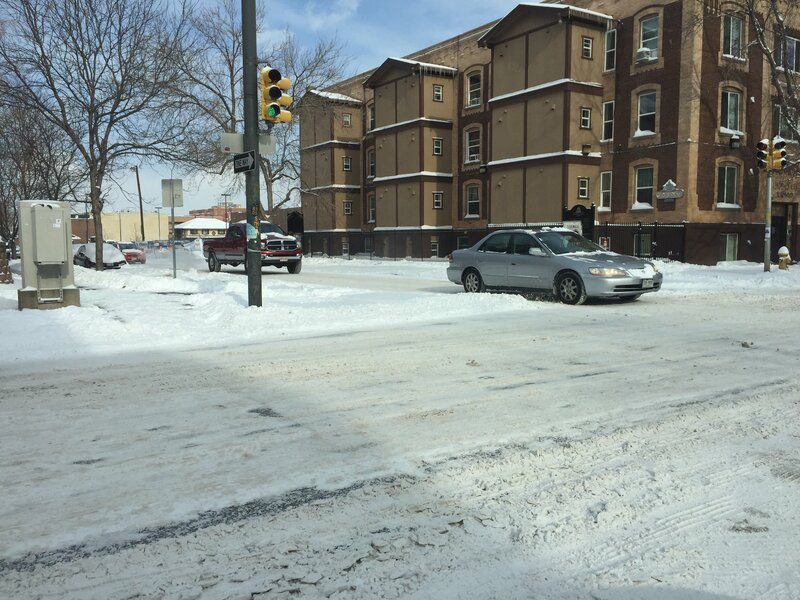 As drivers traced paths through snow after this weekend’s storm, a lot of asphalt remained untouched. 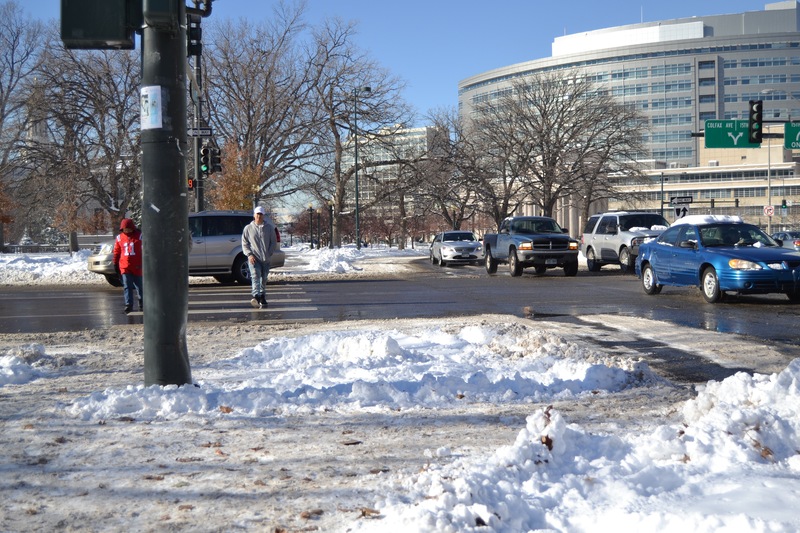 The remaining white stuff is visual proof that there’s plenty of unused space traffic planners could repurpose for pedestrians — especially at intersections. 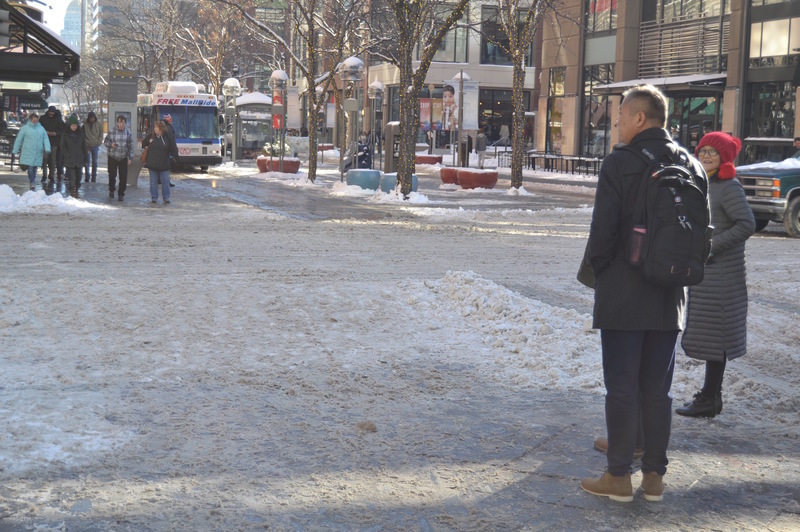 Think of sneckdowns as snow-built versions of the great pedestrian upgrades at 17th and Wynkoop, which Denver Public Works redesigned last year. The photos in this post focus on East Colfax Avenue and other parts of Capitol Hill, as well as the 16th Street Mall. Check out sneckdowns from other parts of the city in earlier posts, and stay tuned for more as winter progresses. 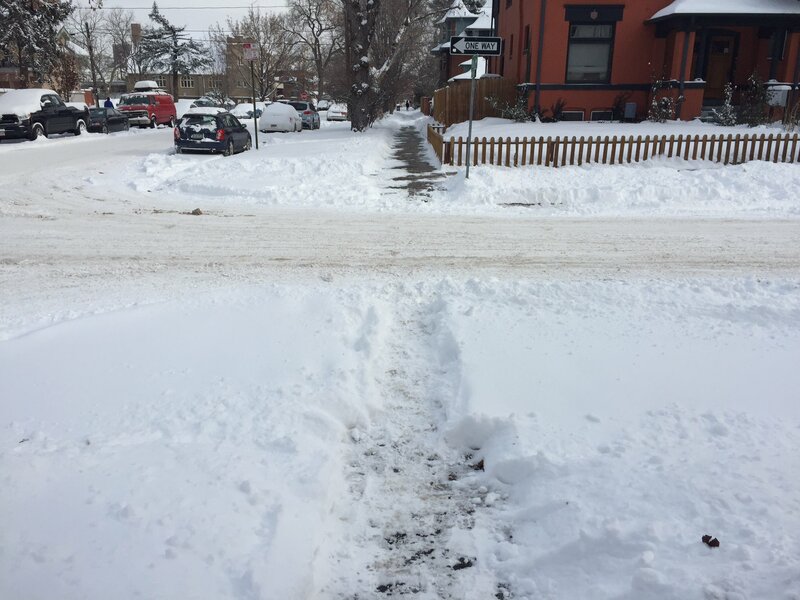 Here are your first documented Denver sneckdowns of the season. Have photos of sneckdowns? Share them on Twitter or Facebook and we may run it on the blog. You can email me as well. It really makes no sense to design streets as wide as what we have in Denver with these huge areas to allow cars to take turns at high speed and then wonder why people are getting killed. Cars drive the speed a street is designed for, not the posted limit. So, are you saying that as an example the curbs could put out to where the cars don’t drive on “as much”? 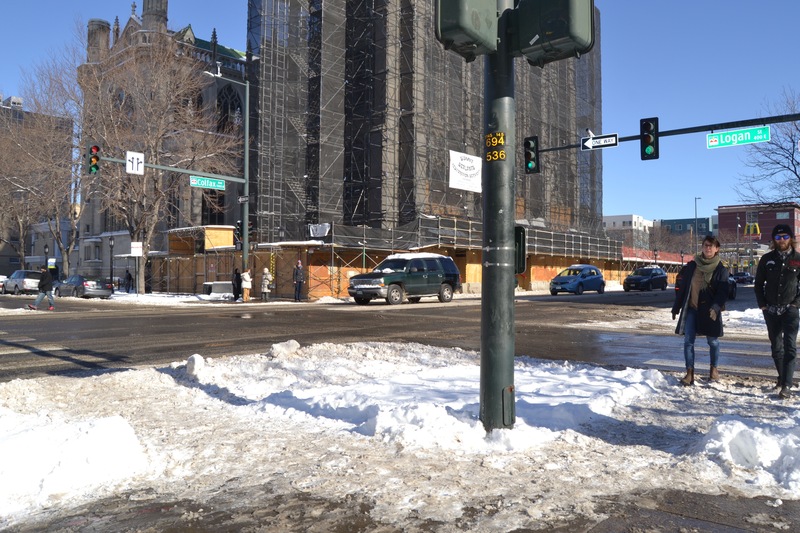 if so, you go ahead and be my guest to stand there at the peak of the 7th photo in this article (Where East Colfax and 15th diverge downtown). I bet you won’t! 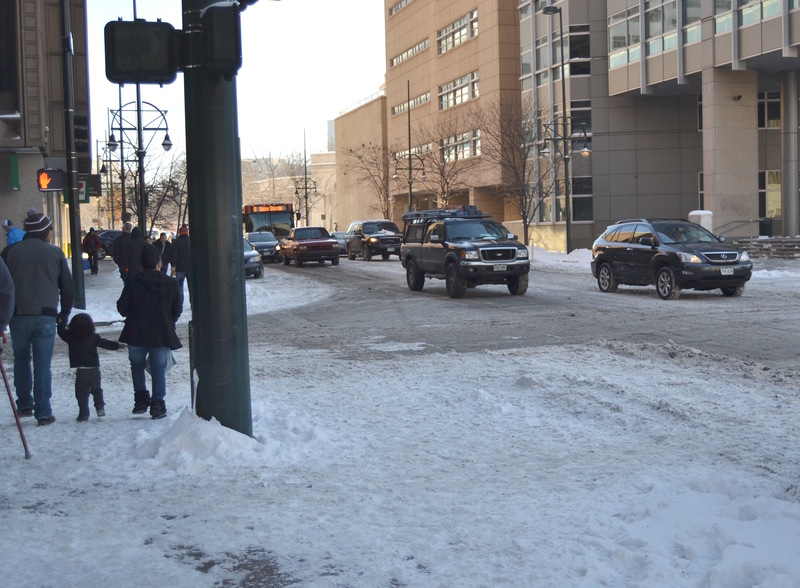 I think the point of this sneckdown exercise it to show where the “shortening [of] crossing distance” for pedestrians can take place, even if only a portion of the sneckdown area is reclaimed. 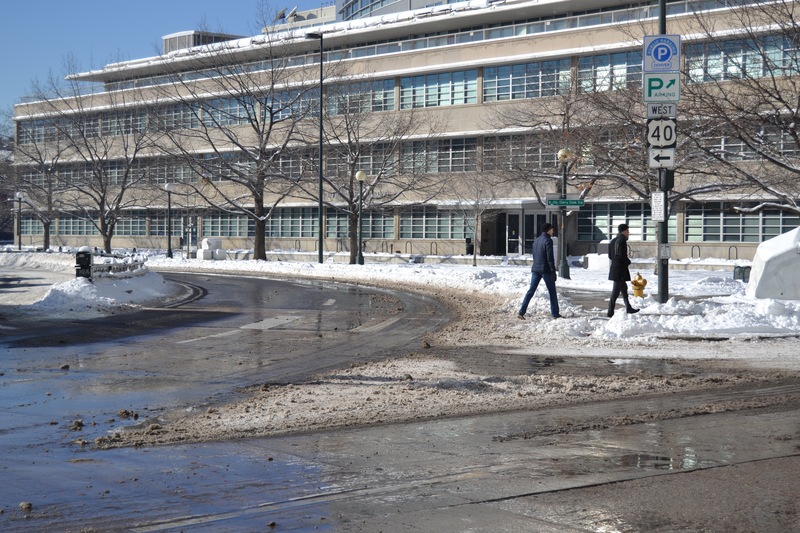 In the linked video on Street Films you also see that a sneckdown made of east coast ice is a persuasive obstacle to driving around a corner fast. I do notice that many of the intersections involved have at least one one-way street intersecting. This takes away 2 of the possible turns that can occur and leads to bigger sneckdowns. So what about the desire to turn “high speed” one ways back to 2 ways? I’d be interested to hear an pro-pedestrian’s planner view on which outcome is more valuable. Second, what about the water drainage concerns with reconfigurations. Having walked many of these intersections, you’ll notice there are significant gradings to facilitate storm water flow and storm drains at many intersections. I’m curious how prohibitive the cost is of reworking an intersection and maintaining its storm drainage functionality.